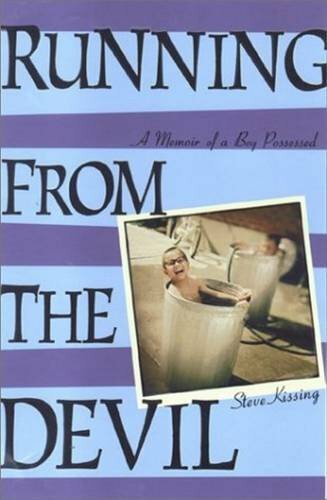 On the way down I read the really delightful, quirky memoir Running From the Devil: A Memoir of a Boy Possessed, written by Ohio guy Steve Kissing. I got the book at the RBTE a couple of weeks ago - rather, Katie got it for me while I was signing books, and she was going on her rounds picking up books other authors were signing, and I'm sorry I didn't pay more attention to what this particular book was when she set it on the pile, and didn't go meet the author then. Running from the Devil is a funny, poignant, almost epic saga. It’s the Prince of Darkness versus the Prince of Dorkness. When Steve Kissing, a quirky kid of the ‘70s, began hallucinating in fifth grade, he was certain Lucifer was waging an all-out war for his soul. But instead of seeking help, Steve stayed silent for fear of being sent away for treatment. Or worse. So he fought back, doing whatever he could to strengthen his mind, his body, and especially, his spirit. On one level, it's a book that anyone who grew up in the 70's, and especially who was growing up Catholic in the 70's, will appreciate. Kissing had much more of the traditional Catholic school education than I did (I had four years of Catholic education, and none of it traditional), so his memories of things like May Crowning our outside of my experience, but his attempt to find salvation through intense involvement in CYO isn't, nor is his evocation of what it was like to be a Catholic teen in the 1970's. On a deeper level, though, his story is one that anyone - even if you're not Catholic, and even if you didn't spend your adolescence concealing your strange hallucinations - can identify with. Although it took a very dramatic and rather heightened form, Kissing's struggle was what we all face during those years: being confronted with new, inexplicable and seemingly uncontrollable aspects of ourselves, aspects that we don't think anyone else can understand, and aspects that we are convinced we must handle and figure out all by ourselves. It's a book that is very funny, poignant, honest and hopeful. And it's got a great cover.